ellehermansen: Eva Trio glasses! Skål! In celebration to our recent purchase of a new car, we decided to celebrate by drinking only the best Moët & Chandon Champagne from the largest vineyard estate since 1743. We got this tasteful treat from our lovely neighbours. Tusen Takk! Scarlet Johansson was kind enough to stop by and open the bottle for us, thanks for sticking around for a glass! (showcasing the Champagne glass before it was filled in the picture at the top). I say these are the coolest glasses I have ever seen as they have a slight slant around the rim of each glass. It can be a little difficult once you drink out of them the first time, but once you have it, you're on a roll! 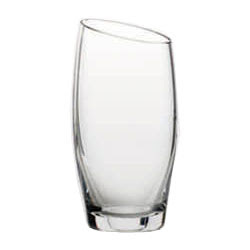 We will also be getting a few more from the collection as they also have white wine, dessert and vann (water) tumblers. Eva Trio is a part of the same line as Eva Solo. But where's the Duo? I love the Eva Trio website ad campaign! They really know how to showcase their products by upsizing. How on earth can this lady relax at at time like this? She has SO much coffee to finish! Drink it or bathe in it! Don't waste! 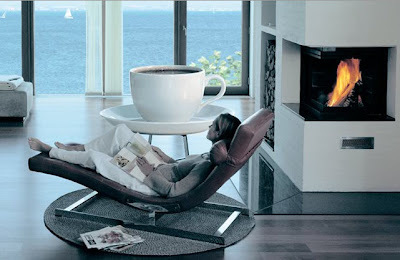 That cup is big enough to heat the whole house - save energy and turn off the fireplace! ps. I'll be writing about our new car tomorrow!